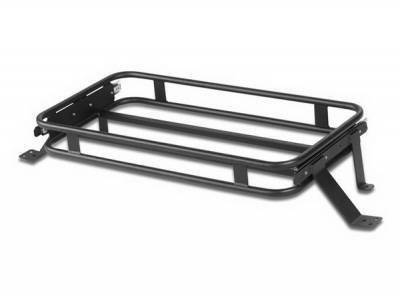 The Interior Cargo Tray is a great storage solution for the TJ Wrangler. The tray has a 100 lb carrying capacity and is available in either a sliding or fixed-mount configuration. The sliding version pulls outward beyond the tailgate to make loading and unloading a breeze. Both Cargo Trays operate with the rear seat folded forward, down or removed altogether. The entire unit may be easily removed when not needed. It is constructed from heavy-duty steel and black powder-coated.